How is political and citizenship activity represented? Rather than looking at political ideologies, institutions, groups or identities, Kimbell and Barry take the individuals and their acts a a starting point. 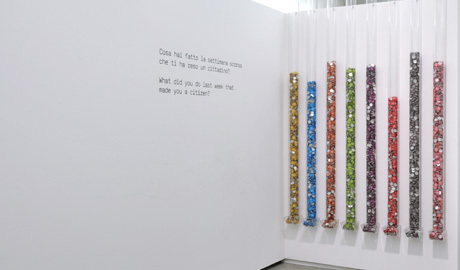 They invite the visitor to publicly show their everyday political and citizenship activity. 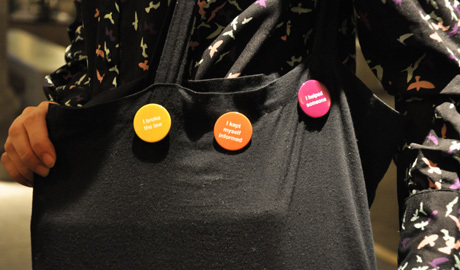 In Pindices you can take button badges with phrases of different acts (eg. I recycled, I said what I believe) arranged in 2m-high plastic tubes. From a distance they resemble physical bar charts. 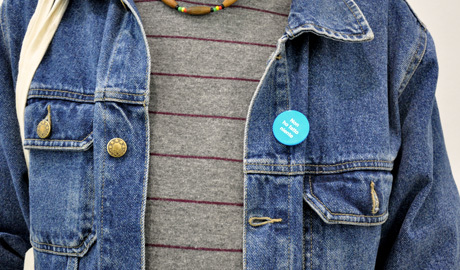 As people take the badges, the levels in the tubes vary, presenting an aggregate view of political activity. Pindices was a collaboration with sociologist Andrew Barry (then director of the Centre for the Study of Invention and Social Process at Goldsmiths, now at Oxford University Centre for the Environment). This practice-led project sought to design means for making political activity visible, but not in the ways typically measured by polling agencies or by using the normal methods of social science.